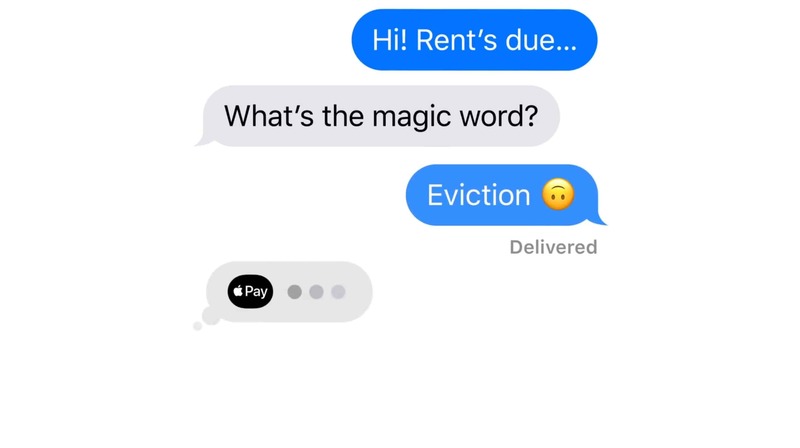 Warning messages from your landlord aren't always a joke, but a new ad for Apple Pay in Messages is. Apple Pay isn’t just for trips to Starbucks. It can also be used to send or receive money from friends. Or your landlord, as shown in a humerous new ad. Money can be transferred in a simple text using the Messages app. This works for sending and receiving the cash, after Apple Wallet has been properly set up. It’s called Just Text Them the Money, for obvious reasons. Before sending money with Apple Pay, it’s necessary to have a credit or debit card configured in Apple Wallet. This is where the money will come from. If that’s taken care of, open the Messages application and start a conversation with the person you want to send the money to. Or tap an existing one. Next, tap on the Apps icon and then the Apple Pay icon. That will add a black Apple Pay box to the conversation. Use the + or – buttons to set the amount, or type it in with the keyboard. Hitting the Send button will submit the request, which must be confirmed with Face ID, Touch, ID, or passcode. Apple Pay is currently available in 29 different market, having last month launched launched in Poland and Norway. And Austria might be ready to join the list. This service first went live in its initial market, the United States, on October 20, 2014.